Liebherr-Hydraulikbagger GmbH will invest over €30 million in a new development and demonstration centre at the site in Kirchdorf over the next five years. Construction work started in 2017 and is expected to be completed by 2021. A testing hall with administration building, a large test site and a demonstration area are to be built on a total area of 12.68 hectares. The key component is the 19.2m-high testing hall. All prototypes will be built, commissioned and optimized here in the future. Doors with a height of 13m also make it possible to drive the fully-assembled machines, also large port and harbour material handlers, out of the hall. A test environment is also being constructed in order to improve the components installed in the machines. The administration building will offer space for up to 100 modern workstations on four levels. The practical tests and inspections to be implemented will be prepared, evaluated and documented at these workstations. The design of the test site also includes — in addition to various digging facilities for earthmoving and industrial machines — a noise measurement site for evaluating and optimizing the noise emissions, as well as an approximately 900m-long testing track with slope and various poor-quality roads for road tests. In order to give potential new customers, as well as existing customers, a better understanding of the operating principle of the machines within the framework of practical tests, an area for customer demonstrations, training and sales and marketing tests is planned. The existing area for the expansion and the proximity to the existing site were decisive in the choice of location. “With the new development and demonstration centre we are making ourselves fit for the future. It enables us to optimize develop- ment and test operations. For instance, today we can already develop future machine technologies and test them out extensively according to market requirements”, states Werner Seifried, Head of Technology at Liebherr-Hydraulikbagger GmbH. Liebherr-Hydraulikbagger GmbH develops and produces a comprehensive range of high-quality hydraulic excavators, material handlers and articulated dump trucks in Kirchdorf. 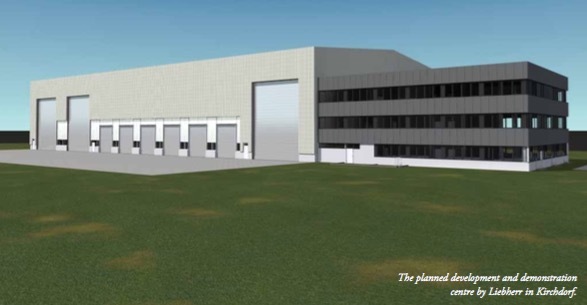 In order to meet the requirements for an increasing number of different machine types, as well as size and complexity, with ever shorter product development cycles, the company is planning a new development and demonstration centre.